The global microdermabrasion devices market was valued at around US$ 150 Mn in 2017. It is anticipated to expand at a stable CAGR of more than 4.0% between 2018 and 2026, according to a new report published by Transparency Market Research (TMR) titled “Microdermabrasion devices Market – Global Industry Analysis, Size, Share, Growth, Trends, and Forecast, 2018–2026”. 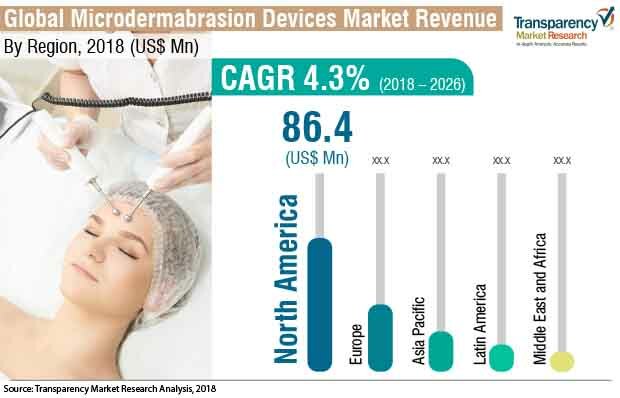 Expansion of the global microdermabrasion devices market is due to the rise in demand for non-invasive procedures and increase in awareness regarding usage of microdermabrasion procedures for skin-related issues during the forecast period. The microdermabrasion devices market in Asia Pacific is expanding with a high potential to grow, at a CAGR of more than 5.0% due to high prevalence of skin-related issues, development in the health care sector, and increased focus on innovative technologies in the region. The global population is aging rapidly, especially in some developed countries such as the U.S., most of Western Europe, and Japan. This is attributed to improved health care infrastructure, reimbursement policies, and advancement in health care facilities in these countries. Moreover, easy access to advanced technology providing non-invasive treatment has improved in recent years, especially in developed countries. Furthermore, the long-term treatment nature of these devices has increased their popularity among consumers, particularly the working class population who looks for treatments with less procedure time but long-term results. The geriatric population is a major end-user of microdermabrasion devices treatment in order to enhance their appearance. Increase in demand for non-invasive procedures drives the market for non-invasive equipment devices such as microdermabrasion devices. Moreover, introduction of handheld devices in the microdermabrasion segments is likely to increase convenience for service providers, thereby driving the adoption of these devices and expansion of the overall market. Microdermabrasion devices are utilized in various esthetic procedures as an effective non-surgical approach to treat acne, fine wrinkles, stretch marks, and hyperpigmentation and sun spots. These devices are available in two forms, based on their use; namely, professional devices operated by trained estheticians and personal devices utilized directly by consumers. Non-invasive nature, instant effect to treat various skin disorders, and negligible recovery time of microdermabrasion procedure drive its popularity among patients and are major factors that are anticipated to drive the market during the forecast period. Pristine microdermabrasion systems, by Viora, and Derma Peel Crystal Free microdermabrasion equipment, by Genesis Biosystems, are major brands employed by professionals. Microderm MD, NuBrilliance and Kendal Professional are other popular brands in the personal use category. The multi-billion dollar medical tourism industry is expanding at an annual growth rate as high as 20% to 25%, which offers significant opportunities to medical devices such as microdermabrasion equipment. This is due to the availability of up-to-date treatment facilities, skilled doctors and consultants, and low cost of treatments in countries such India, Thailand, Malaysia, and Singapore. Factors such as language barriers, expertise, and lack of technologically advanced equipment are no more existent in some medical tourism hotspots such as India. This is anticipated to significantly drive the overall microdermabrasion devices market, especially in developing countries across the world. Introduction of a concept called ‘medspas’, which combines the benefits of medical clinics with day spas, in the U.S. market is expected to have a remarkable positive impact on the microdermabrasion devices market. According to the International Medical Spa Association, the number of medspas in the U.S. has increased four times since 2010. These settings are primarily benefitted by the involvement of certified doctors, who conduct the treatment procedures in a highly relaxed spa-like environment, thereby increasing the consumer trust in the services offered. Based on end-user, the market has been segmented into hospitals, dermatology clinics, and others segment. Currently, the hospitals segment holds a prominent market share. It is projected to account for a considerable share of the market by the end of the forecast period, owing to the increase in preference of patients to perform procedures at well-equipped hospitals. In terms of geography, the global microdermabrasion devices market has been divided into North America, Europe, Asia Pacific, Latin America, and Middle East & Africa. North America is estimated to hold a leading share of the global market during the forecast period, owing to the high rate of adoption of microdermabrasion equipment and high health care expenditure in the region. Europe is anticipated to account for a significant share of the global market between 2018 and 2026. Increase in the importance of esthetic appearance in Europe is projected to fuel the market in the region during the forecast period. The market in Asia Pacific is projected to witness expansion at a high growth rate during the forecast period, due to increasing health care expenditure and adoption of esthetic procedures in the region. While, the microdermabrasion devices market in Latin America is at a pivotal point, currently, which was valued at more than US$ 7 Mn in 2017 It is anticipated to witness significant expansion during the forecast period. Key players covered in this report include Johnson & Johnson, Lumenis Ltd., Allergan Plc, Syneron Medical Ltd., Silhouet-Tone, Skin for Life, Koninklijke Philips N.V., Altair Instruments, Viora, and Dermaglow. Companies operating in the global microdermabrasion devices market are focusing on strategic collaborations in order to develop advanced technology devices in emerging markets such as Asia Pacific and Latin America.